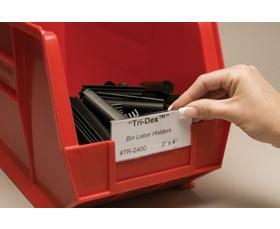 Now a complete labeling system for plastic bins and totes. In addition to traditional self adhesive Bin-Buddy’s™ for labeling bins and totes without label slots, New "Tri-Dex™" label holders snap into bin slots to protect label or bar code on all four sides. Both products are packed 25 per package with ample laser inserts for cost effective designation changes. Replacement laser inserts on perforated letter size cover stock sold separately. FOB Shipping Point.